From piers beside the financial heart of Hong Kong, a stone's throw from roads choked with traffic, and the frenetic stresses seething within the stock exchange, ferries run to three outlying islands. The smallest of these is, for the time being, also the most populous. And yet, there are no cars, only motorised trolleys, mini ambulances and fire engines  and a couple of their full-sized counterparts, which are limited to waterfront roads. Nor are there high-rises. It's rare to hear the pile drivers so typical of urban Hong Kong; residents in greener areas are more likely to complain about cicadas, belching frogs, and the crazily persistent cuckoos of spring. 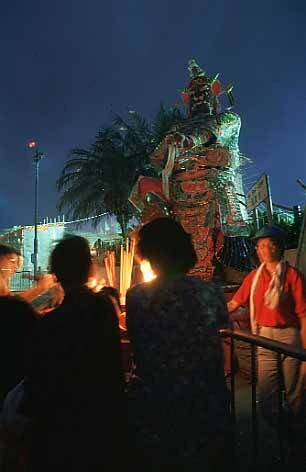 As if these differences didn't set it sufficiently apart, the island, Cheung Chau, is downright quirky  what other place do you know where the chief annual festival involves feeding ghosts, then banishing them to the underworld? Cheung Chau is essentially two lumps of granite that have been weathered into hills and headlands, and are linked by a causeway of sand, gravel and so forth washed up by the sea. Along the eastern shore of the causeway is a sandy beach. To its west is the harbour, sheltered by headlands and breakwaters. The causeway is crammed with housing, which also clusters over adjoining hillsides  few people want to live far from the all-important ferry pier. A little north of the pier is the temple to Pak Tei  the Northern King, who is like Cheung Chau's patron saint. Legends tell of ways he helped islanders in times of crisis, especially when plague struck late last century. Then, his first emissary was a stranger known as the Crane Brother, who rode about in a chair with knife blades for seat, arms and footrest. The plague subsided. It returned again after Crane Brother left, and a local took a turn in the chair, and the benevolent Pak Tei again came to the rescue. This temple is the focus of events during the Bun Festival, which is peculiar to Cheung Chau, and held each spring. 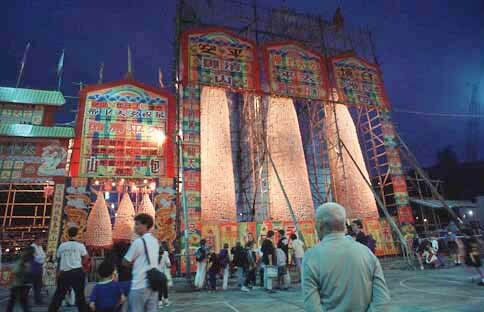 Three bamboo towers are erected, and covered with buns which are left out for three days while Taoist priests hold ceremonies and islanders make offerings in shelters made from wood, bamboo and tin sheets lashed together with plastic twine. The "buns"  fist-sized globules of steamed white dough  are food for wandering ghosts, which abound on Cheung Chau as many people were killed by plague or brigands, leaving no descendants to care for them. On the third day, there is an afternoon parade with lion dancers, flag wavers, musicians, and floats carrying children dressed and made up like immaculate dolls. Though the parade makes the Bun Festival seem like a carnival, the night belongs to an exorcism. Incense, ghost lamps, food and wine draw ghosts to a narrow lane near the temple. Once the ghosts have assembled, Taoist priests sit at the end of the lane, solemnly chanting incantations. Towards midnight, one checks the ghosts have had their fill, then an effigy of the god of the underworld is burned, taking the ghosts with him. The buns are hacked to the ground; it is said to be lucky to eat them! Elsewhere are temples to Tin Hau, goddess of fishermen, with dingy interiors smelling of incense. Here and there along the narrow streets are rocks set in small shrines  they are residences of the Earth God, who looks after the neighbourhood, and is in turn tended to by elderly women with burnt offerings and servings of food. A centrally located banyan also has a shrine; it's reputed to be the source of Cheung Chau's prosperity, and arguments flared over plans to chop it down for a road widening scheme  a restaurant opposite was demolished instead. The island is home to a substantial fishing fleet. Some boats fish locally. But most range far from Hong Kong, down to the Philippines and even Indonesia, on trips than can take four weeks or more. At Chinese Year, they throng the harbour, their masts strung with flags, as families celebrate together. Once this festival is over, the harbour swiftly empties. At other times, relatively few boats are in, unless a typhoon comes close (during these, ferries stop; Cheung Chau is briefly cut off). 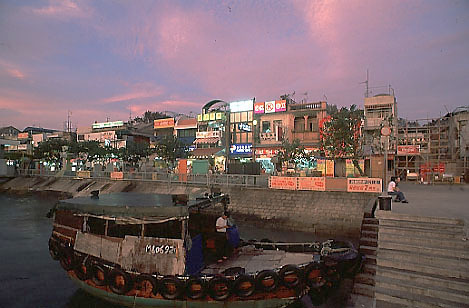 Thanks partly to the beach, Cheung Chau is popular with Hongkongers, who arrive for the day, sometimes on overnight visits. In high summer, the beach can be pretty well packed. Windsurfing is also most popular at this time, though die-hards go out year round, the wilder ones even trying their luck when typhoon warnings are in effect and most folk are indoors. One band of regulars frequents the Windsurfing Centre; some enter local competitions, one former regular  the owner's niece, Lee Lai-shan  won Olympic gold in Atlanta. But for many people, the centre is just a place to relax on a balmy afternoon, watching the windsurfers perform against the backdrop of Hong Kong Island. In the far western tip of the island is a "cave" named after the 19th-century pirate Cheung Po-tsai, whose fleet raided shipping in the approaches to the Pearl River. Legend has it that he stored his booty here. But there's no evidence to support this; certainly no one crawling through what's really no more that a cleft in the rock has emerged with buried treasure. Perhaps then, it's best just looked at from outside, its location worth visiting mostly for views of the coastline, which here is wild and rugged, with great boulders resting above a tiny cove, and another Cheung Chau oddity, a tycoon's landscaped garden that invariably seems deserted. Elsewhere on southern Cheung Chau, scattered along pathways that switchback around and over headlands and low hills, are aging, colonial style houses that may have been rather grand in their day, with verandas, fish ponds and sea views; but nowadays are mostly neglected, their gardens overgrown. They're surely relics of brief period early this century, when much of this southern portion was designated an area where government permission was needed for residence  apparently with the aim of making it a high-class district, perhaps for Europeans only. Happily, such days seem long gone; one of the stones that marked the boundary is set beside a main route from southern Cheung Chau to waterfront yet, well hidden by a tangle of vegetation, it is largely unnoticed by the hundreds who pass by it each day. As evening approaches, the restaurants along the streets and waterfront make ready for their main business. Given islanders' predominantly conservative tastes, most are straightforward, Cantonese style. Seafood dominates menus  fish from tropical reefs, lobsters, prawns and shellfish can be bought from aquariums at or near the restaurants. Late on clear summer days, the sun drops towards the peaks of Lantau Island, which dominates views beyond the harbour. 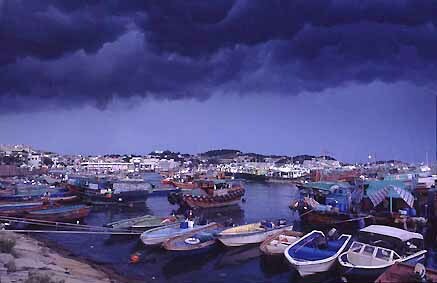 Bathed in a warm yellow glow, an intense blue sky above, Cheung Chau seems less a part of a major business hub, more an island adrift in the South China Sea. To see more photos and articles by Martin Williams, visit his website, The Wild East.